OMYGOSH!! I loveeeeeeeeee this! LOVING that frost on the tree!!!!!!!! Yay for twisted citron and embossing paste! Awesome tree! And I LOVE this adorable winter scene Mackie!!!! Happy New Year! Gorgeous shaker card, Mackie!! 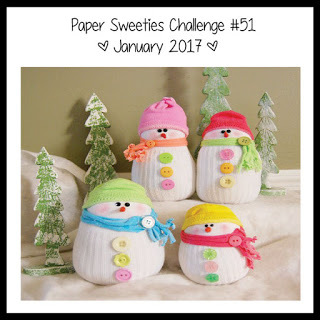 Love the winter scene with the pile of snowballs and snowman! I don't have the snowball set(you've inspired me to buy it):-) Lovely tree with snow, too!! Happy New Year to you and family!! FABULOUS! LOVE all the details and the snow on the tree is just genius! Happy New Year, Mackie! Happy New Year Mackie! Super cute shaker card! Love the little winter wonderland scene that you created! What a little work of art Mackie ~ WOW!! Love the texture on your tree!! Mackie, this is absolutely AMAZING! I LOVE it! Thanks for a terrific year of inspiration and ideas! Have a warm and wonderful 2017! And I hate to do this to you, but you know I have to . . . ROLL TIDE! (smile)! Should be a great game! I absolutely love shaker cards so this is just fantastic. Your snowman is super cure wearing his little hat.